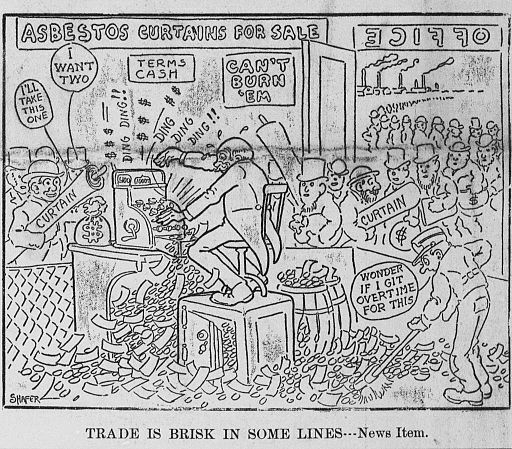 The cartoon above was drawn following the Iroquois Theater fire, which took place December 30, 1903, in Chicago, Illinois and in which at least 602 people died. It was the deadliest theater fire ever in the US. The theater was billed as fireproof, however, the fire department had toured it before opening and found it deficient, as had others, including the use of wood in the construction and a lack of fire exits but they were unable to stop it opening and operating. A fire started backstage, during an afternoon performance when a cloth curtain went on fire, and flames climbed high above the stage, igniting canvas stage scenery. The “fireproof” curtain was blocked from dropping by the construction and was later found not to be fireproof anyway, containing only a small amount of asbestos! The audience included many women and children and the only way out was down a staircase that was blocked by the many people trying to use it at the same time. As the actors and stage hands leaving at the back managed to escape, their escape doors let in blasts of wind that fanned the flames at the front, creating a fireball that incinerated those still trapped in the upper levels of the theater. The tragedy was the impulse for many health and safety laws on theater safety.